I've written about the Dreikönigskuchen before—see post here—the bready, raisin-studded delicacy that Swiss families enjoy on the sixth of January, Epiphany. This year it falls on a Saturday, a great day for brunching with friends and family—so I thought I'd up my Dreikönigskuchen recipe to make enough for a crowd. I made one big batch of dough, split this into two and then made one traditional loaf and a family of mini buns. First, plump your raisins. Put them in a bowl with the brewed tea and let sit while you prepare the other ingredients (or you can do this the night before). In a stand mixer with a dough hook, mix together the flour, salt, sugar, and yeast. Add the milk, zests, butter, raisins, and tea, and mix on medium speed until it forms a smooth, stretchy dough—about ten minutes. Alternatively, knead by hand for about 20-25 minutes. Let rise until doubled, about 2 hours. 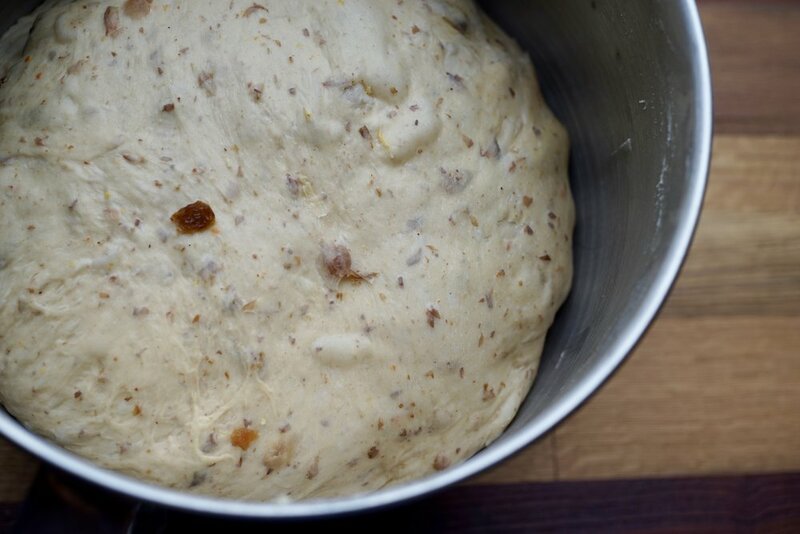 Split the dough into two and form half into little buns, and half into one large loaf. Split off eight, 80 g portions of dough and roll each into a ball. Make sure to press an almond or marzipan ball into the bottom of one of the balls, then pinch the dough together around it so it's sealed in the ball. 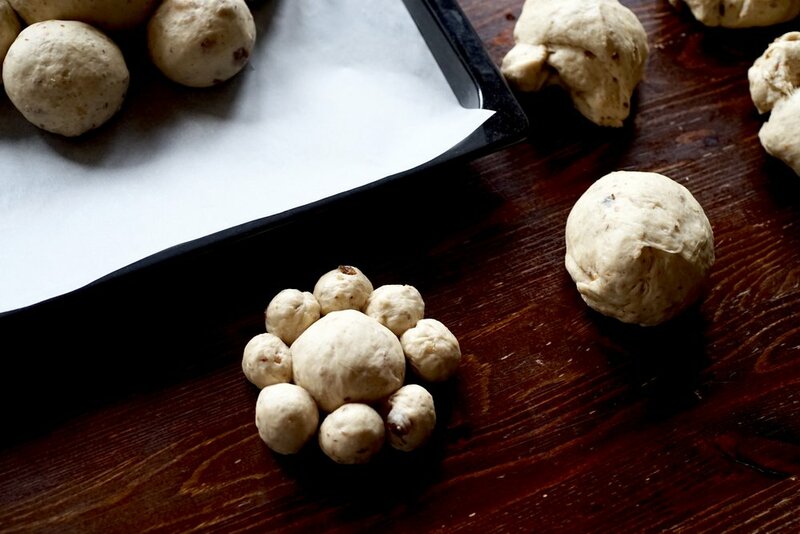 Use the rest of the dough to form a bigger ball, place this on a parchment covered baking sheet, then place the eight little balls in a circle around it. Split the rest of the dough (about 1 kg) into 8 equal pieces, around 125-130 g each. 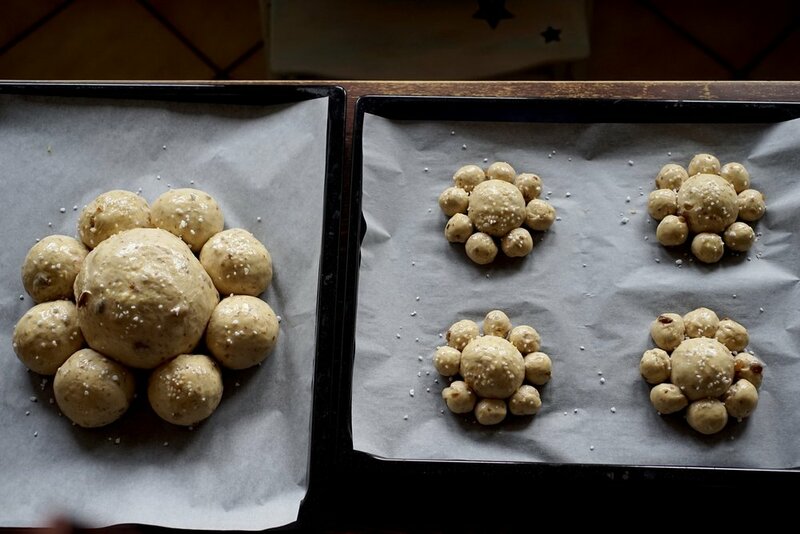 For each of the eight pieces, split the dough again into one 50 g piece for the centre, and eight 10 g pieces for the little balls. Make sure to press an almond or marzipan ball into the bottom of one of the bigger centre balls, then pinch the dough together around it so it's sealed inside. Place the centre pieces on a parchment covered baking sheet, then place the eight smaller balls in circles around them. Let this rest for 30 minutes. Preheat your oven to 180 C / 350 F / gas mark 4. Whisk the egg and brush it evenly over the bread. Sprinkle with pearl sugar. Bake for about 30 minutes, or until the bottom sounds hollow when tapped. Bake for about 20 minutes, or until the bottom sounds hollow when tapped. Whoever finds the almond or marzipan is king for the day! 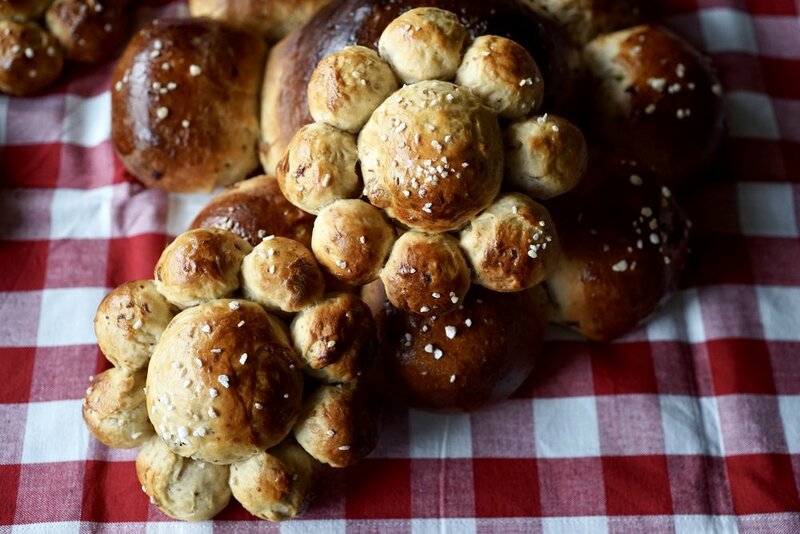 Of course you can make two large loaves, or 16 mini buns with this recipe, whatever you prefer. I like the look of one big loaf that has seemingly spawned the baby buns. With lots of dough to weigh, cover your scale with palstic wrap to minimize the mess. Alternatively, top with flaked or slivered almonds.